to do now that the Chess season had finished. Me, Keith, Todor, Eddie, Mickey, Michael and Lindsay. The full squad of Bells 1 all at a lost what to do next. Mickey: "Let's go up the West End and chat up some girls." Eddie: "Let's go up the West End and pick a fight with someone." Todor: "Let's stay here and drink some more." Lindsay: "Let's stay here but not drink so much." Michael: "Let's get the cards out and have a game of poker." Keith : "Let's get the Chess set out, I'll show you a study." on how to fill in our spare time till September. girlfriends will expect to see on Sundays & Wednesday." Mickey: "No way man, I need the Sundays and Wednesdays for a rest." Michael: "If we got nowhere to go we won't be allowed out." Todor: "Think of something Chandler, I don't want to drink alone." Todor: "Good idea. I'm fed up with bottled beer." Lindsay: "I'll close the door." Me: "Not a draught, draughts,checkers." Eddie: "Chequers, that's the country home of the Prime Minister." Michael: "What go and visit Chequers?" Mickey: "Good idea, we can get a couple of girls..."
Me: "No you bunch of pratts. Checkers, Draughts the game. We could enter a team in the Edinburgh Draughts League." Me: "We could call ourselves the Sandy Bells Draughts team." Me: "They play in pubs." Todor: We meet here to drink and play Chess on Sundays and Wednesdays. 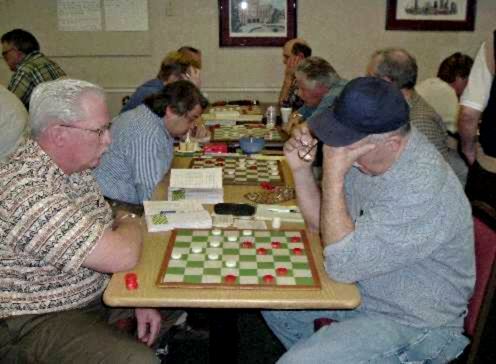 We can meet here on Monday & Tuesday to play draughts." Michael: "They only play on 32 squares - it will be easy." Lindsay: "They only have two pieces - it will be very easy." Keith: "I know some draught studies." So anyway I did some research and found some fascinating stuff. 20 games and lost them all. Sadly it appears as though the Draught League no longer exists. League but I cannot find anything about it). But first I shall inform you Chess players what my research has discovered. it's history. The more I looked the more interested I became. over James Wyllie (Scotland) in 1847. They had played four previous matches. The style of play was Go-As-You-Please (see below for an explanation GC). Soon, Anderson retired, and Wyllie claimed the Title. In 1859, Robert Martins (England) defeated Wyllie. Wyllie regained the Title in 1864, and beat Martins again in 1872. Wyllie won two matches over W. R. Barker (USA) in 1873 and 1874. Robert Yates (USA) won the World Title in 1876.
and later died at sea at the age of 24.
until his defeat to James Ferrie (Scotland) in 1894. Richard Jordan (Scotland) defeated Ferrie in 1896. Jordan defeated Robert Stewart (Scotland) in 1897.
in order to cut down on the number of draws. were chosen at random. Six of the Two-Move Openings were "barred"
as being too one-sided. Two of them lose a piece outright. (Sounds like a Latvian Gambit GC). with Jordan. Jordan defeated Harry Freedman (Scotland) in 1902. In 1903, Jordan resigned the Title, and Ferrie accepted it. Jordan later died in a train accident in Edinburgh. was played between Great Britain and the USA. Great Britain won easily. ...and so it goes on till up to the present day. If you want to find out more visit Jim Loy's web site. (type in Draughts + Edinburgh in any search engine. Or try SDA. The Scottish Draughts Association). who was born in Edinburgh on the 4th of November 1872.
three years he won the championship of his native city. the old master 2-1 with 17 draws. defeating the then World Champion James Ferrie. retiring from World Championship Matches in 1903.
at the New Calton Cemetery, Edinburgh. So. Richard Jordan was the World Champion when he died. A Scottish Alekhine! How come this has been kept quiet? I surfed some more and found this on another site. by exponents of games like chess. and subtleties simply not found in any other board game. there is still plenty of new play to be found by the adventurous player. at a much deeper level than you would do in a game like chess. I found some opening advice. 11-15 - Considered to be Blacks strongest dominating the center. 23-19, 8-11, 22-17 often follow. 16-19 with black attacking 19.
with many traps awaiting white. (This is the opening for me... The Double Corner. The DENNY, an even opening, often followed with 22-18, 11-16. 12-16 - The DUNDEE - weak for black, since 24-20 cramps his Single Corner. for Black if played correctly. they are 23-19, 22-18, 22-17, 23-18, 24-19, 24-20, 21-17. Here is a game illustrating a trap from the 11-15 opening. This is the Draughts equivalent of 'Scholar's Mate' its called the Goose Walk. 15-19! 24-15,16-19,23-16,9-14, 18-9,11-25,28-24,5-14, and Black wins. The position after the last move 5-14.
from Chicago in a Blindfold Fool's Mate. as it was named after the Edinburgh v London match 1824-1829.
they used it in games 3 & 5. Winning the match 2-1 with 2 draws. worry about the Ruy Lopez or any of the Bb5+ lines in the Two Knights. through my Vienna phrase (2 Nc3) in the 1980's I tried 3 a3 a couple of times. of cheapo's) I must get rid of them somehow. I have just racked out an old note book. It took me 25 minutes. 20 minutes longer than it did to find info on Richard Jordan. get the Queens off. But then the pawn on d6 wins easily. something I have only managed twice under tournament conditions (and won). tends to bring out the best/worst in people. from Mike (the Bells 1 player). 1. e4 c6 2. d4 d5 3. Nd2 Qb6 "The Edinburgh Variation" very recent too (well, in chess terms) Got its name from the 1985 Brittish Championship held in, well, Edinburgh. I've looked at the chess games archived on http://www.chessscotland.com/games.htm from that tournament but there is only one game that ended in a draw. Well, according to Schiller anyway, info from his UCO published 2003, so whether this is the universal name or not who's to say? So it looks like Eric Schiller has already given Edinburgh it's own variation. A poxy Qb6 in the Caro-Khan after one game that ended in a draw. after a variation, a duff variation at that? 1 e4 e5 2 Ke2 I am naming this 'The Schiller attack'. I've just surfed the net and tapped in "Edinburgh Variation + Chess"
The Book that Tony Miles said was "Utter Crap"
the Kitchener Folly. Avoid this book and don't play the Qb6 line. Well don't do it in Edinburgh.